• We offer care to dogs, cats, birds, fish, and other exotics/pocket pets in addition to looking after your home while you are away. • Cancellations submitted within 24 hours of first date of service are subject to a $20.00 cancellation fee. • Our services are provided within a designated area of Albuquerque. Pet-sitting assignments for those who reside outside our service area will be accepted on a case-by-case basis and will incur additional charges. Please visit https://duckandturtle.wordpress.com/service-area/ to view a map of our service area. • For Overnight Care, we require a clean, safe environment. We do not offer 24-hour stays. • Households requiring care for more than 3 pets will incur additional charges. 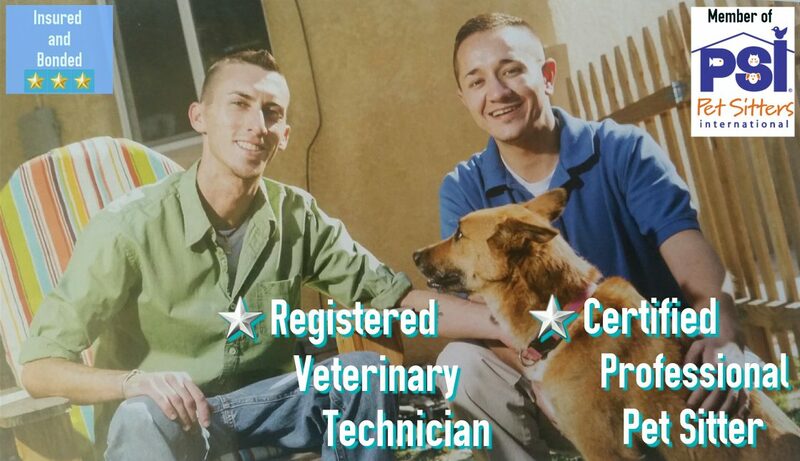 ☺ You get the care and expertise of a Registered Veterinary Technician and a Pet Sitters International™ Accredited Pet Sitter. ☺ Dog walks are always included with pet-sitting at no additional cost. ☺ Light plant watering, mail retrieval, and light clean-up are included with pet-sitting at no additional cost.